NEW BEDFORD, Mass. 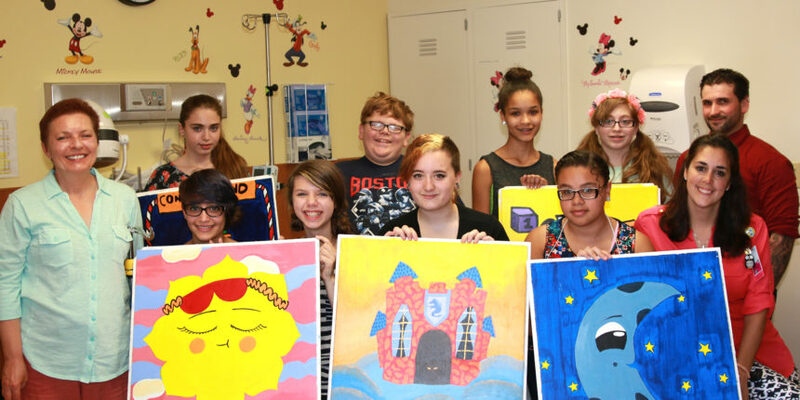 – Southcoast Health unveiled today ceiling tiles with child-friendly artwork created by the New Bedford Art Museum/ArtWorks!’s Teens Reach Beyond program for St. Luke’s Hospital’s pediatric unit. The ceiling tiles were decorated by teens ranging in age from 12 to 17. Over a 24-week period beginning in October, the teens completed 28 2-by-2-foot acoustic ceiling tiles for placement in six exam rooms within the pediatric unit. The paintings are meant to enhance the exam room environment and help alleviate anxiety for young patients, explained Kara Levoshko, MS, CCLS, Certified Child Life Specialist at Southcoast, who initiated and helped organize the project. The Teens Reach Beyond program supports creative and career skills for teens through weekly art instruction, dedicated projects for the community and personal growth. The program is funded through the City of New Bedford Community Block grant, New Bedford Local Cultural Council and the John Lipsky-George Whittaker fund. The arts provide opportunities not only for personal enrichment and enjoyment but also serve as a vehicle to build 21st century skills such as critical thinking, problem solving, and team collaboration that are vital to today’s workforce along with offering the means to contribute positively to the community, said Smook.